Phorid fly infestations can be tough to control. Often, the challenge doesn’t arise from the treatment, but from the difficulty convincing clients that the root of their concern is buried underneath a slab floor — in the form of a broken sewer pipe that is contaminating the soil. Breaking the news that they need to bring in jackhammers, open the slab, remove the soil, fix the pipe, replace the soil and repair the slab can be a tough conversation. It’s extremely important, then, to not be wrong. ⦁ Carefully inspect walls and ceilings for signs of leaky sewer pipes. ⦁ Ask your client whether a toilet or sewer backup has ever caused an overflow in the structure. ⦁ Check the basement for a faulty ejector pump, if the sewer lines are hung overhead. 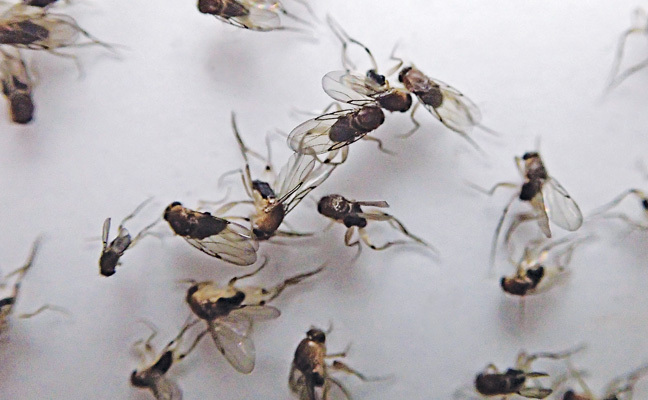 Any of these factors could reasonably create the conditions necessary for phorid flies to thrive. One commonly encountered phorid species, Megaselia scalaris, goes by many names: the humpback, scuttle or coffin fly. If the account is a funeral home, perform an inspection to ensure that sanitation practices are up to par. The bottom line is this: Phoridae will often breed in soil that has been contaminated by sewage. But before bringing in the heavy machinery, perform a full inspection to ensure there isn’t a simpler solution.